Many travellers in Southeast Asia still limit their visit of Cambodia to a short trip to the magnificent Temples of Angkor. While Cambodia is justly famous for its unique historical heritage, the Kingdom has much more to offer than just Angkor Wat, and visitors are welcomed with open arms to discover its treasures, many of which are still largely untouched by tourism. There is a wealth of travel experiences, ranging from trekking adventures in the pristine wilderness of one of the numerous national parks to exciting overland journeys to hill tribe areas which are rarely visited by tourists, to relaxing breaks on one of the empty beaches, to in-depth explorations of the splendour of the Khmer civilisation of which Angkor Wat is no doubt the most spectacular testament and which should of course not be missed by any first-time visitor. But Cambodia also offers a wealth of less obvious attractions, for example the many small but fascinating discoveries visitors make, be it on a cyclo ride through the bustling capital of Phnom Penh or when observing the goings-on in a fishing village during a homestay with a Khmer family. Among the most captivating experiences on a journey through Cambodia are the many encounters with its warm-hearted people – no doubt Cambodia’s greatest treasure. Despite their unspeakable suffering in the past they have not lost their charming smiles. With their hospitality and optimism they make Cambodia a truly rewarding travel destination. 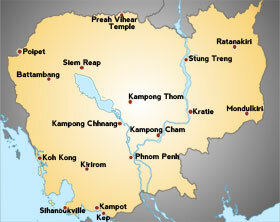 Cambodia is situated on the Indochina Peninsula and occupies an area of approx. 181,000 sq km. Cambodia shares borders with Laos, Vietnam and Thailand and has a coastline of approx. 400 km. 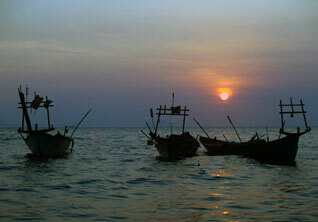 There are also numerous small islands which belong to Cambodia. The Kingdom mainly consists of the so-called Cambodian Basin, which is only a few metres above sea level and which is bordered by mountain ranges in the North, East and West. Cambodia’s highest mountain is Phnom Aural (1,813 m). 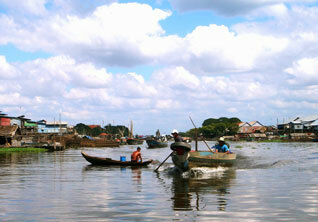 The Mekong and the Tonle Sap lake and river, which joins the Mekong in Phnom Penh, form the life veins of the country. During the rainy season the water level of the Mekong rises to such an extent that large areas of country are flooded and the Tonle Sap river changes its direction of flow, feeding the Tonle Sap Lake with enormous quantities of water. This results in an expansion of the lake to several times its area during the dry season. The time difference between Cambodia and Europe is 6 hours (CET +6). During the European daylight saving time this is reduced to 5 hours. Cambodia’s climate is tropical with three distinct seasons. The rainy season lasts from June to October. It is followed by a cool dry season from November to January and a hot dry season from February to April. The rainy season is characterized by short, heavy rainfalls that rarely last for more than an hour. Continuous rain as known in Europe is very rare. Average temperatures range from 27C to 31C degrees. Approximately 90 percent of Cambodians are ethnic Khmer. Minorities include Vietnamese, Chinese, Cham and Khmer Loeu, the indigenous people populating the Northeast. Only about 20 percent of Cambodians live in cities. With a population growth of approx. 2 per cent per annum Cambodia is among the world’s fastest-growing nations. 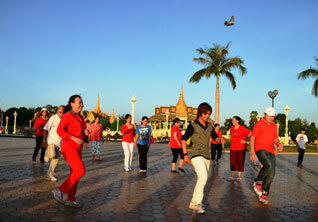 More than 40 per cent of Cambodians are younger than 15 years, whereas only three per cent are older than 65 years. Average life expectancy is 58 years. At 30 per cent the illiteracy rate continues to be very high. Cambodians are generally considered tolerant, hospitable and helpful. After the unspeakable suffering of the past they long for peace and harmony. Conflicts and problems are thus often met with a smile and solved by compromising.